I would like to share about a small roll-off roof observatory (RORO) that I am building in Singapore. It is nearing completion and I am waiting for a few heavy showers to ensure it doesn't leak before I start to move in more equipment. In making a decision, solutions like SkyShed PODs, several Australian options, and more premium products were evaluated. The issue that effectively killed all of these options was the shipping cost. Other options like the SkyShed PODs were also known to leak; in tropical Singapore, it would flood. Hence, I eventually decided to engage a contractor to build a shed, similar in design to those offered by SkyShed (not the POD) (http://www.skyshed.com). 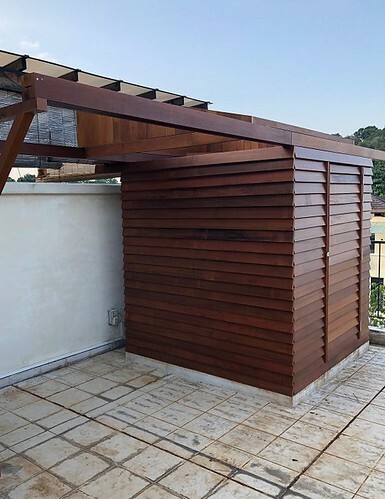 The shed was built out of Chengal wood (I realize that it is an amazingly hard wood; driving a self-tapping screw is a serious task). Hopefully it will last 10 years at least. Below is a system diagram. The core of the system is a Hystou (https://www.hystou.com/) fanless industrial PC. I hope to address the components in more detail in future posts. One of the easier part to describe is the All-Sky camera. To meet the requirement of remote operations and safety, I figured I would like to be able to see the sky before the RORO is opened, or to make a decision whether to image or not. This is an ASI290MC in a transparent covered, sealed junction box purchased from Sim Lim Tower. I wrapped it in aluminum tape in an effort to minimize heating. However, the temperature of the sensor soars up to 50 deg C during the afternoon when in use! I used AllSkEye (https://www.allskeye.com/) as the capture software. It is an extremely flexible piece of software, and due to the camera temperature in the day, I have set it to capture at intervals only at night. A timelapse video is created at the end of the capture in the morning. 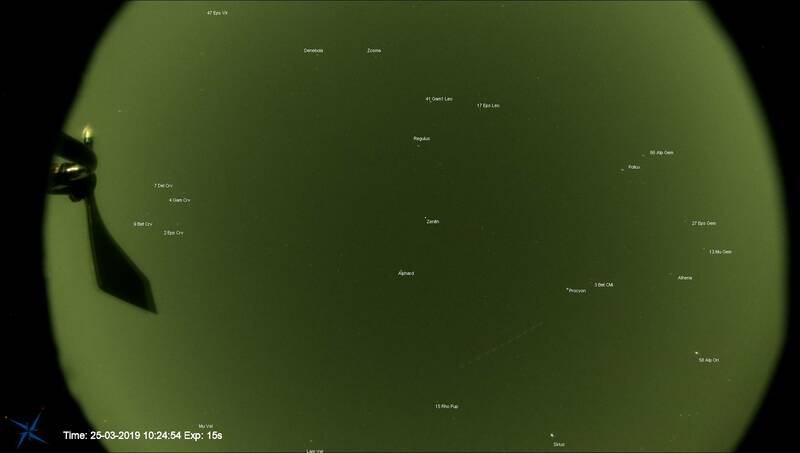 AllSkEye has features like meteor detection, overlays, etc. Attached is a frame with a star overlay. An improvement I hope to test is cooling the box with a drip irrigation tube and a sock! Interesting project Joe Cool! The structure looks big. The whole structure only has camera, mount and some electronics ? What does it look like inside? Your roof looks big enough to include a sheltered visual observatory...ever consider a further upgrade to this ? The structure is 6x6 feet. Not exactly that big. It is rather empty at the moment except for the PC and some wires. I intend to move in a Losmandy mount and a William Optics AP setup. I might swap it out with an SCT later in the year when the planets are better positioned. Once the tripod goes in, it will feel a little cramped! The roof is also where the laundry goes. Hence, no plans for any expansion yet! Next up is the Weather Station. I'll describe the physical devices here and talk more about the weather safety monitor in a later post. I based this project heavily on https://github.com/manojkoushik/Arduino ... Conditions. It comprises of the Arduino Sketch, the ASCOM driver, and a Windows application to view the data. The Arduino was constructed using an Arduino Uno, Sparkfun Weather Shield, and an MLX90614 IR thermometer. The Weather Shield provides data such as pressure, humidity, ambient light, and, when connected to the anemometer, provides wind speed and direction data. The image below shows an early hookup of the system without most of the wires. The anemometer used is the Davis anemometer. 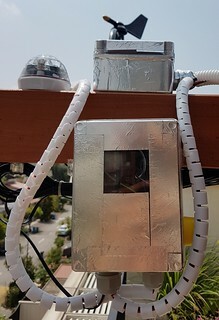 Some information on the physical hookup is available at http://cactus.io/hookups/weather/anemom ... anemometer. Connecting to the weather shield required a modification of the wiring and a change in the code since the circuitry on the shield was designed for a different anemometer. The IR thermometer is used to measure the temperature of the sky. When it is cloudy, you might have noticed that it is generally warmer than when the sky is clear. This difference between ambient and sky temperature can be used to estimate cloud cover. I have found that a difference of about 8 deg C or below corresponds to overcast skies while 12 deg C (the biggest difference I have recorded) corresponds to clear skies. You can see the connection to the IR thermometer fitted into a hole drilled in the box. 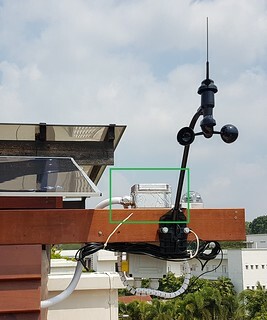 The Arduino is also connected to an Hydreon RG11 rain sensor (the dome shaped device in the image below). This is a neat little rain sensor that can be adjusted to be very sensitive to water droplets. It is also something that won't corrode easily unlike other types of rain sensors. 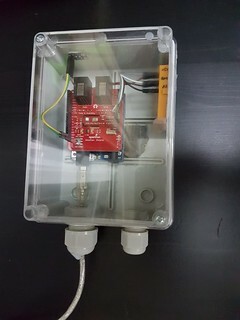 The Arduino is hooked up to the PC and the ASCOM driver is used to connect to it. The driver was slightly modified to adjust the format of the file output and the logic to determine some of the output flags, e.g alert status. This driver will be used by applications, including SGPro, to read the weather data. Closely related to the weather station is the ASCOM Safety Monitor. This is a component that determines whether conditions are "Safe". When conditions are "Unsafe", SGPro can trigger a shutdown sequence to park the telescope and close the observatory. The weather station monitors local conditions. But having a forecast would be nice. And what if a weather station component fails? It is, after all, a DIY project put together with unskilled hands. Hence, I wanted to incorporate several safety checks. I also realized that SGPro polled for the safety status very frequently, in the order of seconds. After some thinking, I decided to write smaller pieces of software that checked safety conditions and reported status via writing to files. A safety monitor then read those files to report overall safety status to SGPro. 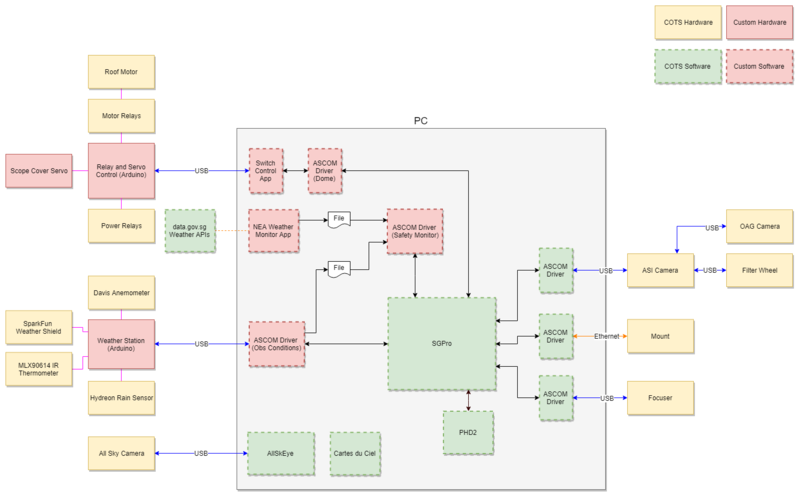 You can see this flow in the block diagram in the first post. One of the ways I decided to address the additional weather checks was to use the Singapore Government's APIs at data.gov.sg. 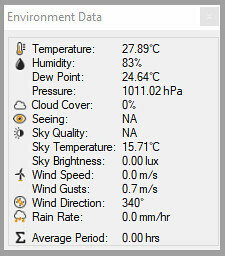 I used the real-time 2-hour weather forecast (unsafe if showers of any kind are forecast) and rainfall data (unsafe if sum of rainfall across Singapore > 0). This way, I can (hopefully) get a more reliable weather warning if my weather station fails or NEA APIs fail (which actually happened)! Now comes the scope cover and flat panel. I 3D printed (using a provider I found on AliExpress) a cover from https://www.thingiverse.com/thing:2307397 and hooked that up to a hobby servo. It is controlled by an Arduino for remote open/close operations. A flat panel is mounted on the wall to provide a source of illumination for taking flats. The panel is too bright for LRGB filters. For the CMOS cameras I use, if the exposure is too short, the high frequency flicker of the flat panel results in inconsistent flats. To get to a target exposure of several seconds at least, I used 2 sheets of ND gel from a camera shop to lower the intensity of the light and a sheet of tracing paper to prevent reflection from the ND gel of the scope illuminated by the panel! 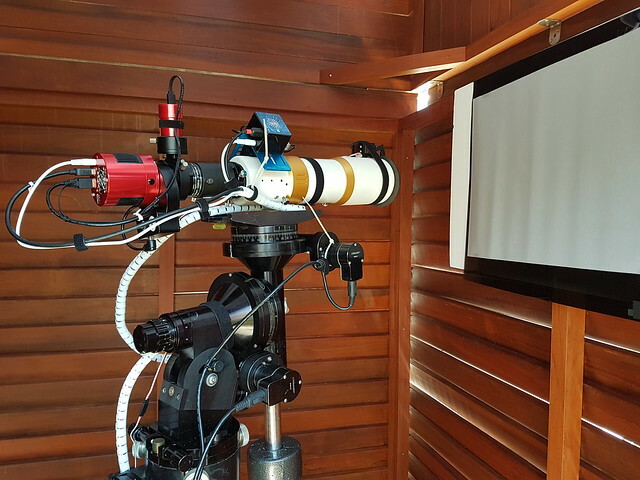 The scope is parked with a custom park position facing square at the panel. But now, the panel is too dim for narrow band filters. Oh well. The Arduino is controlled from the PC via a user interface. Finally, here is the first light capture from the observatory (one of the clearest nights lately)! This was operated remotely from some 10km away.